The Tamil Nadu State Board of School Education is going to release the TN SSLC Exam Result 2019 on April 29th 2019. Students are very interested to check their 10th standard public exam results online. And also everyone would like to know who got state first mark and toppers name and school. Now most of the students searching internet to find Tamilnadu 10th Result 2019 Date and Time. Every year, Directorate of Government Examination, Tamil Nadu (TNDGE) announce SSLC and HSC Results publishing date and time on the official website. Daily Tamil newspapers and TV News channels also make a formal public statement about TN 10th Result announcement date. 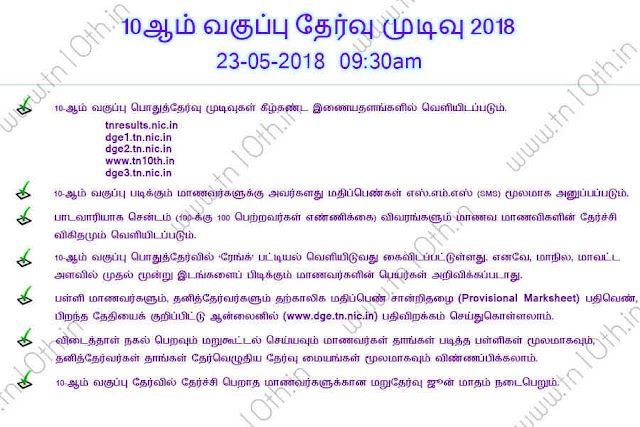 As the TN DGE officially declares announcement details, the Tamil Nadu State Board 10th Result 2019 Date has been updated on this page. The Tamil Nadu Directorate of Government Examination Board (TN DGE) organize 10th public examination from March 14, 2019 (Thursday) to March 29, 2019 (Friday) in all the districts. Even though floods affected some districts in the state of Tamil Nadu, board exams conducted normally. Now students are very interested to get Tamilnadu 10th Exam Result 2019 Date on the internet. The TNDGE not yet announced the exact date and time of declaring SSLC result March 2019. But we expect the Tamilnadu 10th Result 2019 should be released on 29th of April 2019. Published 10th / SSLC March Exam Result 2018 online. Uploaded subject wise marks online for SSLC students. Result link will be activated shortly. Getting ready to publish 10th public exam results Today at 9:30 am in Tamil Nadu and Puducherry. 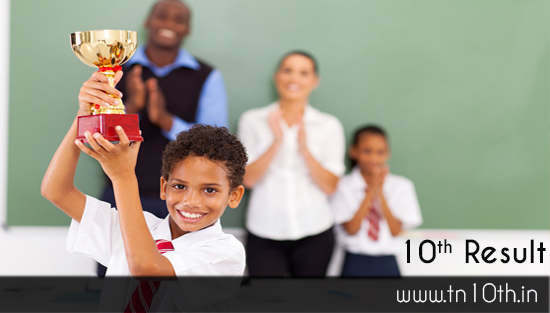 Counselling for students has been initiated for 10th class students to be mentally strong. Students can make use of the counselling by 104 service and 14417 service provided by Tamilnadu Education Board. Released official SSLC Result App for Android and iOS smartphones / mobiles in Tamilnadu. All the students can check their 10th result through android app or iOS app with Register No & DOB. Completed tenth standard public exam paper corrections in Tamilnadu. Started preparing for 10th Result Analysis along with the district wise and school wise performance report. Answer sheet corrections stated for 10th standard in Tamil Nadu. Around 42,000 teachers appointed for SSLC exam paper corrections at 80 different centres in all over Tamilnadu State. 10th class exams are completed and paper corrections yet to be started. SSLC public exams started today throughout Tamilnadu & Puducherry. Around 9,64,491 students appeared. After publishing the results, students can visit the official website like tnresults.nic.in or dge.tn.gov.in to check Tamilnadu SSLC Result 2019 Toppers and state first. You should know private candidate or students DOB. Without date of birth you cannot able to check TN 10th std Results 2019. We have updated the confirmed date and time of announcing 10th class result 2019 online after it was officially declared. Check this page regularly to know the new and correct date of SSLC Exam Result 2019 publishing Online. You can also check 10th Revaluation and Supplementary Exam Result publishing date and time here.